“Tahitian War Galleys in Matavai Bay, Tahiti” by William Hodges. Captain James Cook, on his first exploratory voyage in the Pacific in 1769, encountered a “tall, impressive” Tahitian named Tupaia who was “an expert in the arts of politics, oratory, and navigation.” Across a daunting cultural divide, the two men attempted to share their knowledge of the region. 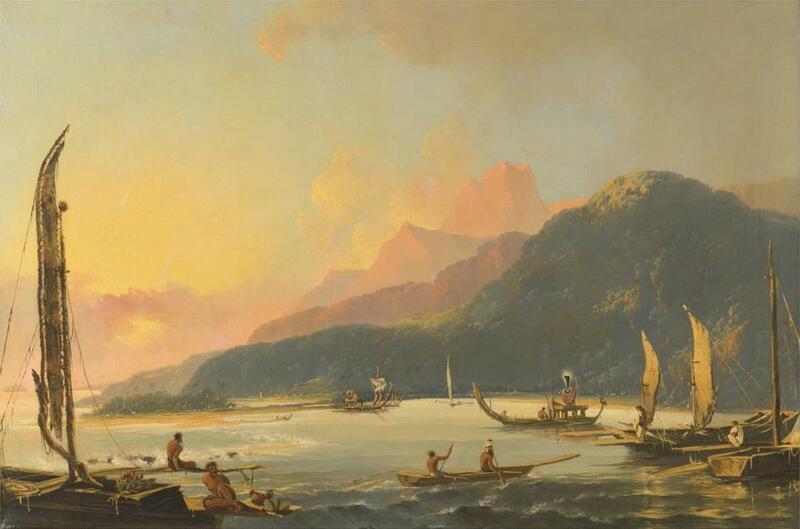 When the Cook expedition left Tahiti, Tupaia eagerly joined it. Two months later, upon reaching New Zealand, Cook’s men were met by hostile Maori, one of whom they killed. New Zealand is more than 2,500 miles southwest of Tahiti. There seemed no reason, to Cook and his officers, why its residents would speak Tupaia’s language. But the evidence was undeniable. “Sea People” does a marvelous job of covering every line of inquiry into this phenomenon. It’s a grand, symphonic, beautifully written book, drawing on findings in anthropology, archaeology, oceanography, linguistics, DNA research, radiocarbon dating, and Polynesian myth and folklore as it examines a reality that, when first apprehended by Westerners, seemed to defy explanation. Thompson, as it happens, has a leg up on this subject. Her husband, whom she credits with helping her “see things in a different way,” is a Maori from New Zealand. (She recounts the story of their courtship in her 2008 memoir, “Come on Shore and We Will Kill and Eat You All.’’) The Harvard Review editor touches briefly on their travels with their three sons within the “Polynesian Triangle” (cardinal points: New Zealand, Hawaii, Easter Island), but most of “Sea People” is an archive-researched historical account that has the page-turning qualities of an all-absorbing mystery. Thompson acknowledges “the claim that any European explorer discovered anything in the Pacific — least of all the islands of Polynesia — is obviously problematic.” But it did take a combination of Polynesian and Western input — sometimes embodied in a single person such as Anglo-Irish/Maori anthropologist Te Rangi Hiroa — to fathom how, in prehistoric times, Polynesians’ ancestors were able to reach and establish themselves on some of the world’s most remote islands. In the 1960s, New Zealand historian Andrew Sharp argued that while Polynesian mariners had spread across the Pacific without assistance from westerners or God, no evidence supported “the myth of deliberate long off-shore voyages in the days before navigation instruments.” More likely, he contended, they had drifted there, propelled by ocean currents and prevailing winds. Yet computer models contradicted this by showing that drift alone would never have gotten anyone to Hawaii or New Zealand. Some details on the chronology of this ocean-wide diaspora inevitably remain vague. An earlier version of this story incorrectly stated where New Zealand is relative to Tahiti. It is more than 2,500 miles southwest of Tahiti.